Prefer ? Click here ! With our WoW PvE Mythic+ Dungeon boosting, our boosters are here to clear through the Mythic+ dungeons on your behalf so you can sit back and indulge yourself on abundance amount of loot that is gained. We offer the option of Pilot where our professional boosters here will log in to your account and complete the dungeon on your behalf or you have the option of self-play and join the booster as he clears the dungeon with you. 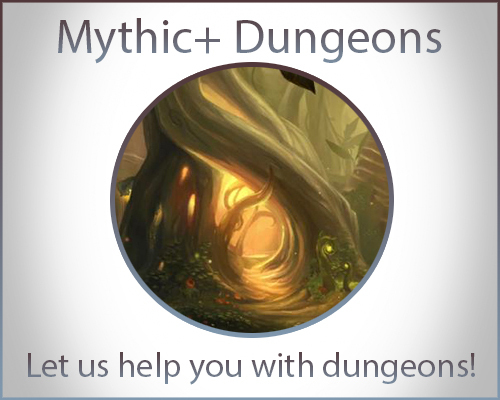 We are offering you a large variety of dungeons up to +15 Mythic level! Keep in mind that Mythic+ will not be available during the first days after they have been enabled in the game. If I have any concerns about how can I reach you guys? You can contact our live chat we are available every day 24/7 or you can contact your booster directly. Are there any regions you guys don't boost on? Not at all, we have boosters in every region of World of Warcraft. We accept PayPal, Credit/Debit Cards and G2A which includes Skrill, Paysafecard, Bank Transfer, Bitcoin, Alipay, G2A Wallet, Neteller as well as Steam Skins. Is it an issue if I want to buy another order after my current is finished? Estimated Delivery time is less than 24 hours. Level 110 Character on the EUROPEAN server! Item in your weekly Class Hall chest according to the highest Mythic+ you completed (935+ for M+15). Good boost and good service by Sebastian :) ill be back for more one day. A+! Very quick and very good! Communication is great! Thanks Costin!